Tulsa, Oklahoma - The University of Tulsa basketball coach Doug Wojcik announced today the signing of point guard Donte Medder to a national letter-of-intent. Medder, a 6'1" 190-pound guard, is considered one of the nation's top point guards by ESPN.com with a national ranking of No. 14 among prep point guards. 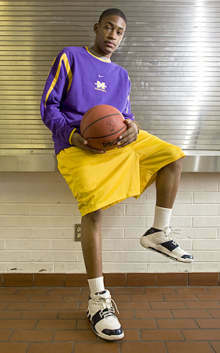 He is also ranked by Bob Gibbons All-Star Sports Report as the 140th top senior in the nation. He was a three-year letterwinner and two-year starter at Mesa (Ariz.) High School. As a senior, Medder averaged 22.6 points, 5.0 assists, 3.9 rebounds and 2.5 steals. He shot 47-percent from the field and 35-percent from three-point range in leading his team to a 15-10 record. He also converted 79 percent of his free throws. Medder was a first-team all-state selection by both the Arizona Republic and the East Valley Tribune. He also earned first-team all-East Valley Region honors as a junior and senior. In his junior campaign, Medder averaged 14.0 points and 6.0 assists while teaming up with the Arizona Player of the Year Aaron Fuller, now at the University of Iowa. During his career, Medder totaled 1,032 points in his three seasons. "There is no question that Donte is the best point guard at Mesa High School in my 11 years here, and I've been told that he's probably the best in the history of the school," said Mesa High School Head Coach Shane Burcar. "Donte is a pure scorer who can get to the rim, shoot the three-pointer and gets to the free throw line. He is a flat-out scorer. He's great in transition," added Burcar. "Off the court, Donte is a high character young man. You cannot find a better person." "We're excited to have Donte join our team," said Wojcik. "He's a highly-ranked player at his position. He is in the mold of a true point guard, which we do not have in our program, so it is critical from that standpoint. Donte can run a team. He has been very well-coached. His dad, who is a head women's coach at Scottsdale Community College, and his high school coach have instilled in him great fundamentals and instincts. Donte is a great addition to our program."